Simply rub off with the eraser or dab off with a damp cloth. The new, modern way for drafting on fabrics. The Sewline Fabric Pencil is easy to use, easy to refill and does an excellent job of marking up fabric, this tool should be in every quilters & embroiderers sewing box. When marking up fabric you want to ensure that the pencil you use gives a good, clean, easy to follow line, this is where the Sewline pencil comes into it's own. Giving a great sharp pencil line, which can easily been removed afterwards. The advantage of using a good fabric pencil, allows you to mark up your fabric and not worry about ruining your quilting or embroidery project by leaving heavy or hard to remove lines. 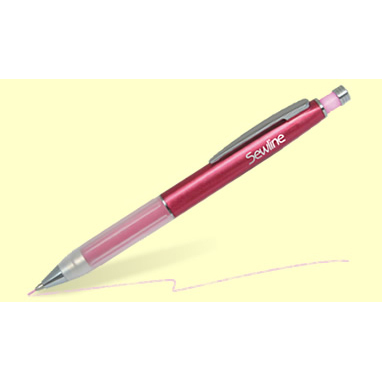 The Sewline Fabric pencil can take up to can take 6 pencil leads at a time. Fabric pencils are often also referred to as a Quilters Pencil, Sewers Pencil, Embroiderers Pencil or Cloth pencil. No matter which you prefer, you can be assured this is a high quality fabric pencil.